Dor (Strings) literally fell into my lap with absolutely no advance notice. My mom sent me this movie before she left for a visit to India. I asked her what it was about and she said to trust her and to just watch it. It sat around for several weeks and since I hadn't heard too much about it, I wasn't in any particular rush to see it. We put it on one night with the idea of watching just part of it and viewing the rest later - 2 hours later we were still watching but not yet ready to part ways with the three characters we had grown to care so much about. Our friend Beth agrees, see her take on the movie here. The story is a simple one yet grows to be quite complex - two women from very different backgrounds meet through a twist of fate and are faced with the question - just how far are you willing to go to save the one you love? The film's mood can be quite intense at times but under the steady hand of director Nagesh Kukunoor it is also tender, humorous and at times full of pure and unbridled joy. The female leads are played by model turned actress, Ayesha Takia and former Miss India, Gul Panag. The male lead is played by Shreyas Talpade who was also in the director's last movie, the award-winning 'Iqbal'. His relationship with Gul's character is truly one of the sweetest and most tender I have ever witnessed on the silver screen - that it was a non romantic one makes it that much more touching. It is so refreshing when a movie challenges the viewer with more than the standard 'boy meets girl, boy loses girl, boy gets girl in the end' plot line. 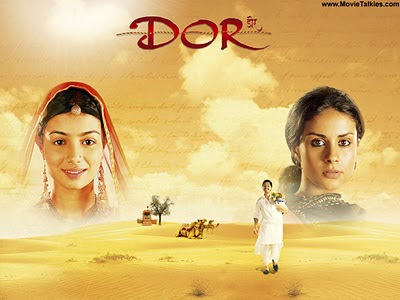 Dor is one of those rare 'perfect' movies in which each actor is brilliant in their role, there is not a single line of extraneous dialogue, where the background photography makes one feel as if they were actually there and every scene moves the story along as if one is turning the pages of a book. Watch this movie, encourage your friends (whether they love Bollywood or have yet to see an Indian movie) to watch it and hope that we are lucky enough to have more movies like this made. The song Yeh Honsla is the standout selection and compliments the movie rather than be the extraneous add on for the actors/actresses to model different outfits while dancing in the rain. Not that there is anything wrong with that but sometimes you just don't need all of that - sometimes less is more. "Dor is my most challenging and dramatic film to date - the pristine locales, the spectacular cinematography and the soaring music all add up to make it a larger than life film. However, at its core, as in all of my films are the human element, the simplicity of the basic emotions that bind us all." If I don't have Netflix, where can I get my hands on this gem? Btw, your movie reviews rival Ebert's! Thanks for the love K! You can get this at most Indian stores as a rental or just sign up for blockbuster.com. They do have it (and most other Desi flicks) there. I watched the movie.real description of feelings of women and choice you should take . Good Work.selection of songs is superb. Why haven't I heard more about this movie? Was it a commercial success? Thanks for a great review - this one's definitely going on my list. Thanks for the kind words Sapna - it's a labor of love for me and so worth it when I get to share the songs that mean so much to me with others. If it wasnt for your blog I would not have known about many of the movies and musicians you write about...LOVED Dor. I just finished watching it - it def moved me! Thanks. I accidentally found your Blog, and I want to say thank you for such nice tips what to watch. I love Hindi movies. After I have read the information, I decided to watch this movie. I already ordered this movie through Blockbuster.com. However, while I am waiting to get this movie I had a delight sneak peak what this movie is about. I have found some scenes from the movie and music songs on the website smashits.com. They have the category Videos-Hindi Film Scenes, Songs. I am excited to watch such a beautiful movie.